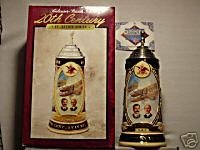 CS311 Budweiser 1997 1990-1919 Lidded Stein 20th Century In Review Series #1 Series: First, 1997 issue date, Edition Quantity only 5,000 LOW NUMBER: Height: 12 1/2", Origin: Germany, Manufacture: Gerz, Material: Ceramic, Lid: Pewter with Pewter Figurine, Special Features: Individually Numbered, Certification of Authenticity, Bottom Stamped, Gift Box, Artist: Don Curran Condition: NEW in Gift Box see picture (no chips or cracks). Policies; 1) Buyer will pay shipping charges (insurance and delivery confirmation included) (shipping to lower 48 states USA). 2) If you are purchasing more than one stein/mug you can save on shipping. Addition shipping per item is 5.95 (this stein shipping is 12.95 due to size). All items to be paid at same time and items will be shipped in same box.